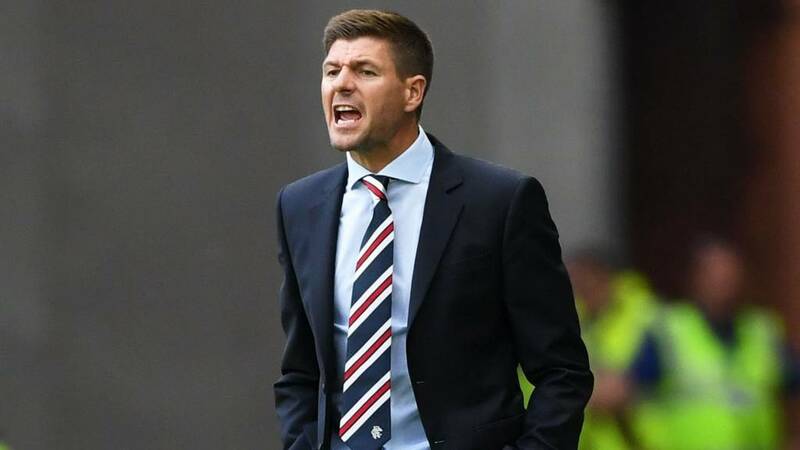 A lot to chew through and as is normal during a new Rangers regime these days, it gets off to a stuttering start and our fans get instantly divided between the grumpy ones who aren’t happy (us) and the optimistic ones (the rest) who think it takes time. Happened with Pedro, Murty, and when things went south for Bread Man, him too. But we were puzzled, truly, when in the second half, manager Steven Gerrard removed Daniel Candeias (already utterly out of position in the middle) and replaced him centrally with defensive midfielder Ryan Jack in an attacking role. We’re at a loss for all of this in truth. First off, why is Josh Windass, a 10 at best, occasionally a left winger, now our right flanker? Secondly, why is Daniel Candeias, our POTY last season, being shoved into the middle from the right? He’s been utterly anonymous in both Ibrox encounters. Thirdly, why bring on Ryan Jack at all? Fourthly, why, as an attacking midfielder, when he’d been out for eight months and isn’t an attacking midfielder? Fifthly, while we’re pleased Ojaria and Middleton got run outs and impressed (our best players, incidentally), why did they not come on in Jack’s place? We get that Stevie is introducing new ideas, and a new shape. We don’t oppose that if it works. He’s learning the ropes and we all knew this would be the case. But some of last night’s management puzzled us. Why was the team actually worse after his half time team talk than in the first half? In Stevie We Trust? Of course not – he’s only just started. Would you immediately trust a new manager who is still only learning? Would you trust anyone in any position implicitly before they actually earn it? What we accept is we go along with Gerrard’s ideas – we urge caution and we hope his legendary status and general knowledge of the game proves him correct. We didn’t blindly trust Pedro, nor Warburton, nor Murty. That is something a Rangers manager must earn – and we will give him time. But we won’t implicitly trust from the off. Especially if he plays Ryan Jack as an AM! It's so simple why he did it we were getting surpassed in midfield for a good 10 mins, the minute Jack stepped on the park it stopped instantly. McCorie had a poor game last nite alongside Candias. Jack should start before them both over there. McCorie doesn't look right the now, rest required possibly,needs looked after and groomed into a better player. Agreed Robbie. I just do not understand any critism of the Jack substitution or his performance. The manager will be ruthless in his determination to get the best from everyone he selects. He will have learned from last night's game. Morelos, Windass and Candeas were round pegs in square holes. And pressure was put on others because of it. Steve Gerrard probably picked up on this before any one watching the game. We made chances and they were not taken. This will be fixed and pronto. Looking forward to Tuesday. Windass doesn't work back??? Maybe you need to go back and watch that 1st goal again and see who started it, in his own half and in the RB position!!! Candeias was poor regardless of where he was played. He spent more time trying daft backheels and other showboating than he did doing his job. That's why he came off. I also thought it odd to bring Jack on - I'd rather have seen Ejaria on earlier. Windass should have been hooked after 30 minutes. Morelos after 20. I agree with most of what you say but your last point is nonsense! Yes, we want to win at Pittodrie but to suggest Gerrard is a failure if he doesn't achieve that is absolute nonsense. Get real for God's saKe! So for years now, we have asked for a manager to think outside the box. The bread man changed things at the same time, for the same players, every game. Like a dodgy game of FM. Murty just chewed his zip and waited for the last 10 mins to change things. Pedro....well no one knew what he was doing....ever!!! Stevie G does things that may look weird but did change the game, before Jack came on I could see them scoring, once he was in that disappeared. Middleton's introduction made us more direct and Ejaria did okay and was direct enough. How can you be critical of that??? Spot on. Ibrox Noise you are, supprisingly, way out on your criticism. Wise up for God's sake! Ditto from me. Why so much negativity . We won 2-0. First appearance in a competitive game at Ibrox for many players. Nerves, pressure in front of 51,000. Well done lads. We're going to give him time... But here's a billion things we already hate. You do realize this team has been together, what, like three weeks? If they still look this way after the first Old Firm, then come talk to me.... Jesus. You're reaction doesn't fit for Game 1 of the year. Especially when every thing looked so glorious just a week ago after Bury was dismantled. Yes, I agree Mark. Of course we are all supporters and entitled to our opinions but felt this post was overly nit picky considering where everything is at in the grand scale of things.Maybe the Macedonians are not a much better team than Bury but with all the pressure, hype and expectation it was a slightly disappointing performance but an okay result, It wasn't pathetic or abysmal as I have read, just edgy with much room for improvement . I don't think it matters who's in midfield or how they playing if your strike force can't hit barn door with a shovel. So many gilt Edge chances squandered.. If you don't know why Jack came on you haven't a bloody clue about football! At that stage in the game, we were being outplayed and in danger of losing pool our lead. And, more importanty, Jack was introduced as a defensive midfielder, to support McCorie:not as an attacking option. And Jack did OK. Certainly he was an improvement on Candesis. 100% correct. Jack was there to shore things up - which he did! Morelis and Windass, as our main striking options were shocking. Sad to say but get rid of both:particularly Morelis. A striker who scores only one in e wry 6 chances is no good to us. His mins on the park to goals scored ratio is embarrassing: as is tendency to get needlessly booked. Mark Rivard's comment is the only one worthy of respect regarding this post. Two games in, two wins and two clean sheets.Sell out crowd last night. What is the problem ? Why the negativity ? Either you support the team, or you don't. Criticism has no place in this equation. It really depends on what you want a player in the attacking midfield role to do. I know the most obvious thing is the traditional No10 role of creating and playing in the hole but look at Pep Guardiola's time at Barca when he played behind the striker - sometimes you want a ball winner in that position to pressure the defence, win the ball high and make the simple passes to the more creative in the team as it takes the pressure off the both the defenders and the midfield while simplifying the forward output options. I'm not saying the dynamic of the game changed dramatically on Jack's introduction, but it did change and for the better.I hold no blind faith in Gerrard as he has a total of 1 competitive game in management but it feels unfair for r this website to criticise him based on a tactical change that you simply don't understand. No manager will last at Ibrox, unless some of the fans just sit back and let the team develop.One month in the job a rake of new players and unless we win 5-0 he and the team have failed, S.G. said when he came in it would take time,you cannot keep changing manager and think everything will be alright over -night no matter who takes the job. Just look at Chelsea,won F.A.cup spent millions and sack their manager,makes you think.S.G.is not daft he will know after a few games what he will needs.Get fed up with this ongoing talk i believe we will have a good season when the players bed down.Scottish football is very much a back water in the football world now and some of the smaller countries who think are are push -over are now in front of us. Take Croatia for a good example say no more. William, I think 99% of punters will wholeheartedly agree with your comment. Jack and McCrorie are DM! Candeias is a Right Wing/Right Mid ...Not Central! We were playing a Team of Nobodies from Fckin Macedonia! Yeah Sure we won 2-0 but we played crap, We were not Clinical Enough and it should have been at Least 4. FFS Hibs Scored 6!. ....I Hope Stevie Rips Them a New one because it wasn't anywhere near good enough! I Have this horrible feeling we are facing another Progres Result. I do not think we have failed in not hammering a poor Macedonian side. I do however think that the game at pittodrie is a must win. If Steven Gerrard or any punter that loves Rangers thinks that giving the second placed team a three point lead over us is a good start or one that can easily be recovered from, they should maybe start supporting Hibs or something. I have supported this club for 31 years. A draw, although somewhat acceptable at pittodrie, would feel like failure. Defeat will psychologically affect the team and it will be very difficult to amend. We MUST beat Aberdeen. We must get back to being Rangers. It starts there with that victory. There is a chance here that by September, we might have psychologically won the league. We need to make sure that happens. Or Steven Gerrard needs to make sure that happens. I think and hope and believe he can. WATP. Rubbish!!! Pittodrie is always an extremely difficult fixture and we cant make demands on the team that we must win or the season is over. I'm fairly certain that we will drop points in the first 4 games but to say we couldn't recover from that is simply not the case. If we lose to Aberdeen but beat them when they come to Ibrox then we are no worse off. The same applies to Ceptic, Hibs and Hearts. The key will be in maximising points against the other teams and sorting out our home record.